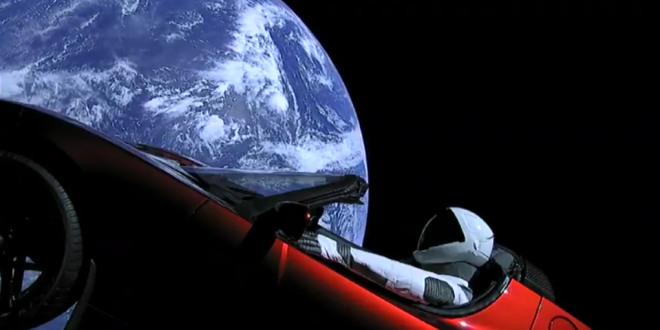 LIVE WTF VIDEO: Starman Drives Tesla In Space - Joe.My.God. The revolution is being televised, live from space. The below live video feed is coming direct from Elon Musk’s 2008 Tesla Roadster, which is currently somewhere high, high above us. On Tuesday afternoon, Musk’s rocket company SpaceX successfully launched Falcon Heavy, the new most powerful rocket currently in use worldwide, from Kennedy Space Center in Florida. The payload for the demonstration launch consists primarily of the Roadster, and a suited dummy named “Starman,” which is featured prominently in the feed. After spending a few hours cruising the Van Allen radiation belts around Earth, the upper stage of Falcon Heavy is set to fire one last time before it detaches from the Roadster, sending it — and Starman — headed toward Mars.